Thought for December 2015: We wish you a Messy Christmas? Are you anything like me when it comes to December? How many times have I said to myself, 'This year I'm going to be organised for Christmas’?! ‘I'll have the cards written by the beginning of December ready to post by the 5th, courtesy of Shipham Scouts (!) or Royal Mail. I’ll do the shopping from the comfort of my sofa. I'll have a series of fabulous Christmas sermons ready in my back pocket just waiting for the day. As if...!!! Maybe lurking somewhere in our minds is the idea of the Perfect Christmas, à la Delia or Nigella. That might include snow, but certainly not the kind that messes up our travel plans. In my dreams it will be both awesome and delicious. More importantly, the very idea of a Perfect Christmas is completely out of step with the New Testament version of the first Christmas. There you find a series of messy events – a surprise pregnancy, an unexpected journey that's got to be made, a complete muddle over the accommodation when you get there...Not exactly a recipe for a perfect or relaxing holiday. And through what looks like the complete mess of the first Christmas, Rowan Williams imagines God to say to us, 'Don't worry – I'm not going to wait until you've got everything sorted out perfectly before I get involved with you. I'm already there for you in the middle of it all, and if you just let yourself lean on me instead of trying to make yourself and everything around you perfect by your own efforts, everyone will feel more of my love flowing'. In Sainsbury’s ad there is a twist as Mog inadvertently calls the fire brigade and saves the house in time, and the neighbourhood then comes together to help the family clean up and enjoy Christmas dinner. Thank you to Kevin Walke for our dramatic magazine cover this month. It boldly proclaims that Christ is Born and a light is shining on the hut in Bethlehem. Or perhaps the light is shining on our home, or our world, because it’s about God at work in our world. Christ has joined the human race and become the agent of its renewal and transformation. As The Message puts it, The Word became flesh and blood, and moved into the neighbourhood. We saw the glory with our own eyes, the one-of-a-kind glory, like Father, like Son, generous inside and out, true from start to finish. How we need that light to shine today... I write in the week of the Paris attacks. I wish you joy in the midst of the mess, and every blessing from the God of ordinary, untidy, and surprising things. Thought for November 2015: Through the eye of the needle! 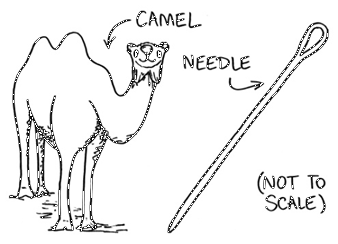 In a gospel reading one Sunday recently we had the passage where Jesus says it is harder for a rich man to enter the kingdom of God than for a camel to pass through the eye of a needle. I have always taken the picture of trying to squeeze a great and stubborn animal through a tiny hole as part of the outrageous humour Jesus used to make people think. It is less entertaining that the "Eye of the Needle" might have been a narrow gateway in city walls of that era. These were very small and easy to defend to allow people to get into the city perhaps at night without leaving the place open to attack. Still camels were often heavily loaded with goods and their riders, and would need to be unloaded in order to pass through these narrow gates. Therefore, the image is that a rich man would similarly have to let go of his material possessions in order to gain access. More disappointingly again(! ), some scholars have also pointed out that there may be some confusion about the words in Greek and Aramaic, which can be translated either as "camel" or "thick rope". Clearly I prefer the first option, but the blunt truth told by Jesus remains that it is very hard for rich people because they do not sense that they need God. John Penton has written a book recently called Widening the Eye of the Needle. This isn’t about camels, narrow entrances or rope, but about how churches comply with recent legislation regarding those with disabilities. It’s about how to make reasonable adjustments so that our churches become more welcoming and inclusive. It is sobering to think that up to one in five of the population has some sort of disability. Wheelchair users are about 7.5% of all ‘disabled’ people. Some disabilities are more obvious, but many are hidden, for example dyslexia, epilepsy and arthritis, to mention just a few. There is something very exciting about a community that can welcome and celebrate the contribution which all can make. I often think back to my congregation in Stafford where we had three people with Down’s Syndrome: Josie, Stanley and Sheila. Josie and Stanley were quieter, but had great warmth about them. Sheila was built rather like a tank and would launch herself at you to hug you. She would often come in a big brimmed hat and from her seat at the front of the church turn round when the service got a bit boring, and give you a great big grin and point to what she was wearing! Between them they helped the rest of us to understand the Gospel in ways that without them we would never have known. Thought for October 2015: The World in Union! Some of us have been waiting for the World Cup for a long time, and October offers a feast of sport. I’m talking rugby, of course... It’s a great team game, both for players and spectators. By the time you read this I will have been to two of the matches, and hope to see a lot more on television. I do, though, have to agree that the broadcaster's decision to bookmark every one of its commercial breaks with a line from World in Union may drive us all up the wall by the time the final takes place on 31 October! The song was commissioned for the 1991 competition, and has a great tune from Gustav Holst’s Planet Suite. The words, by Charlie Skarbek, attempt to capture the spirit of friendship which pervade rugby union the world over, and makes being part of a crowd such a joy. A new age has begun! How the world needs that at the moment... The news has been filled with the escalating crisis of refugees from various troubled parts of the world. Principally they come from Syria, where a war has dragged on for five years, with no sign of resolution. The vast majority are in huge camps on the edges of this country, but growing numbers have risked the perilous journey to Europe. The pictures and stories have been almost overwhelming. I’m sure we have all been shocked and upset by the recent pictures from Calais and Hungary, and, perhaps most distressingly, from the shores of the Mediterranean. Few of us can begin to imagine what it might feel like to leave home because it has become unbearable to stay, and head for an unknown future in a foreign land. A number of people have spoken to me about what we can do to help, something that will make a difference. Bishop Peter, in his Pastoral letter quoted below, has made a number of suggestions. It may be to write to those in authority, or to offer financial support, or to have more hands on involvement. He cautions that we work through established agencies who are already working in the field, which have the skills and experience to do this work – whether that be in Europe or in Jordan, Lebanon, or Syria itself. The Harvest collection at Shipham went to Tearfund, which will enable them to offer care and aid to the refugees that have fled into Europe and are in huge need, as well as helping some of the millions who are displaced or refugees within the Middle East itself. Axbridge has a new CMS partner, David Longe, who has recently become the Chaplain of the Bishop of Jerusalem and the Middle East. This diocese includes Syria, Jordan and Lebanon. David will be able to direct our gifts to appropriate projects with people who know the situation well. If you would like to give something towards this, please let us have it in time for John Angle to deliver our gifts by hand to Jerusalem, when he goes on 18 October. When refugees do arrive in this country, there will be all kinds of issues to face, not least dealing with vulnerable and traumatised people. There are a number of organisations already working in Bristol with refugees and asylum seekers including Bristol Hospitality Network, Bristol Refugee Rights, b.friend, and Borderlands. We might consider supporting what they are doing. World in Union speaks of ‘searching for the best in me’. I wonder how that might affect how we respond, that the desperate may find new hope, and lives torn apart be restored. The Bishop of Bath and Wells, the Rt. Revd. 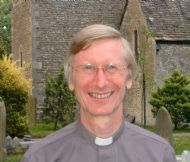 Peter Hancock, has expressed his shock and upset at the refugee crisis in Europe and urged churches and local communities to respond by working with established agencies to support those affected. In a pastoral letter sent to all licensed clergy, Bishop Peter said: “It feels as if there has been a breakdown in the human race’s ability to care for its weakest members. While the big picture of politics and civil war perplexes us, the individual tragedies go straight to our hearts. We all want to do something. Thought for September 2015: An Old Friend with a New Face! The building consists of a nave, chancel, western tower, south porch and vestry. The details of the interior are all tastefully executed: one important deviation from the original style being the discarding of the old-fashioned high seats, or sleeping boxes, as they might be called, and the substitution of the neat open pew, which like the roof is made of Baltic timber, stained... The builder is Mr John Palmer of Weston, whose taste and skill are well brought out in the execution of the work. Having said so much for the church, a word, en passant, may be allowed for the venerable rector himself, the Rev J H Hesse who stands well with his people, and who has stood so for many years. On his first coming amongst them shoe leather was a luxury many of the poor did not enjoy: there was no school-house, or if so not one worthy of the name: and the parsonage situated upon a neighbouring slope, is said to have sympathised with the church in a painful dilapidation. Things, however, are now altered. The worthy gentleman informs us with a benevolent smile that he began first by “putting his own house in order”; next he built a school house, and now he has rebuilt and restored the church – the latter at the expense of £500 – leaving him in debt £100. We hope you will be able to come and join in the Rowberrow Harvest and Patronal Festival on Sunday 27 September at 6.30pm, as we remember the rebuilding work 150 years on. Our preacher will be Bishop Barry Rogerson, my Bishop when I was a curate in Wolverhampton. I should have known better. Through the morning I had joined in part of the Deanery Pilgrimage, during which we walked to five of the little Mendip village churches from Rowberrow to Christon. At each there was that glorious sense of a place soaked in the prayers of centuries. At each we offered our prayers for the people of those communities, and remembered that the church is a sign on earth of a heavenly peace. Mission accomplished at journey’s end. Knowing only too well their daily, unchanging round. Journey never finished, yet never begun. Moving to the rhythm of the surging of his spirit. St Augustine mused on how people go abroad to wonder at the heights of mountains, at the huge waves of the sea, at the long course of rivers, at the vast compass of the ocean, at the circular motions of the stars, and they pass by themselves without wondering. That was back in the fifth century, a bit before the holiday travel industry really got going! Stephen Cottrell quotes Augustine in his little book Do Nothing to Change Your Life. In it he encourages us to discover what happens when we slow down and stop and breathe. We can do that on a beach in Croatia or wherever, but equally we can do it sitting on a chair in our living room and looking out at the garden or the hills beyond. This week the New Horizons mission has been bringing stunning new pictures from Pluto. The interplanetary space probe has been whizzing through space at more than 30,000 miles an hour since 2006. I hope you have a great August, and chance to drink in some new horizons and that peace that we all need. Thought for July 2015: Laudato Si! I have a great admiration for Pope Francis. I often think his is an authentic Christian voice, reflecting what I imagine Jesus might say. Because of that he has a great capacity to ruffle feathers and to shock. Like his recent claim not to have seen television since 1990…! His encyclical, Laudato Si’: On the care of our common home, has only just come out, and it’s bound to create waves, as it already has with some American politicians. In it he urgently appeals for a new dialogue about how we are shaping the future of our planet. “I would like to enter into dialogue with all people about our common home,” he writes. The title of the encyclical comes from a canticle of St Francis of Assisi, and reminds us reminds us that our common home is like a sister with whom we share our life and a beautiful mother who opens her arms to embrace us. The call in the Pope’s letter is simple: there is no alternative but for us to make do with less. It’s not just about recycling and carbon credits. We need to develop a proper respect for limit. We need to value a sense that there is such a thing as having enough, and finding contentment with enough. Far from a counsel of despair, there is an enormous personal freedom to be discovered in being content with not having everything. This the sort of boundless freedom reflected in the life of Saint Francis, who gave up wealth to live with nature, and from whom the pope took his name. “Once we lose our humility, and become enthralled with the possibility of limitless mastery over everything, we inevitably end up harming society and the environment,” he writes. As I write this I’m busy preparing for 30th May when the Bath and Wells Diocesan Association of Bell Ringers celebrates its 125th anniversary with a celebratory service and lunch at North Petherton. It’s my eighth and last year as Master of the Association, and it has been an honour to be involved in something I love and have enjoyed doing since I was ten and living in Yatton. May has also been a landmark moment in the story of bell ringing nationally as we remember the first peal rung three hundred years ago in Norwich. I’m hoping to be part of a full peal to be rung at Rowberrow on 15th June, which includes a method called Norwich Surprise! The ringing of church bells in this country has been deeply rooted in British culture for a very long time. 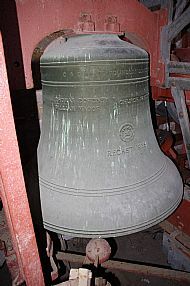 From about the eighth century bells have been used to call people to worship. Beyond announcing church services, bells mark important national or local occasions, past and present. Someone described the sound as providing a ‘grand soundtrack to historic moments’. You may have heard the bells of Westminster Abbey after a big service there. On 9th May, for example, the Abbey bells rang out to mark the 70th anniversary of VE Day, and the Axbridge ringers joined with them and with cathedrals and towers around the country. Bells are also rung for significant family moments. We are often asked to ring for weddings, and for that joyous moment as the couple emerge from church as man and wife. In sad times too the bells are rung. The Shipham ringers rang a quarter peal in March to celebrate the life of Terry Coombs, a resident of the village who sadly died last year. Terry’s wife, Janet, began to learn to ring at Shipham, before she had to spend more time looking after Terry, and the quarter peal was rung by her friends locally. We have much to be thankful for in our ringers who faithfully do their best to make sure that services are announced in the traditional way and the ancient art is preserved. Across the Diocese there are around 1,800 ringers, spread between well over 300 towers. We have teams of ringers in each of our churches, but are always looking to train and encourage new members. Church bells beyond the stars heard… I’ll take that, but then I am a bit biased! If you are interested in Bell Ringing in Axbridge or would like to learn to ring, contact visit Axbridge Church Tower & Bell Ringing or contact the Tower Captain, Roy Shallish on 01934 732137. Sandwiched in the middle of an important month in which we have both a General Election and the 70th anniversary of VE Day in 1945, we celebrate Ascension Day. On the surface it’s the most disturbing of all Christian festivals, because it talks of departure, and letting go of God’s presence. 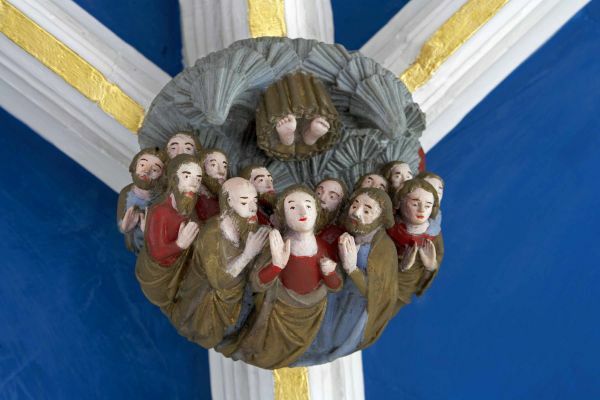 One of the bosses in York Minster has the disciples looking up at the soles of Jesus’ feet, which are disappearing out of sight into heaven. As I write this news has broken of a catastrophic disaster in the Mediterranean Sea with the capsizing of a boat loaded with immigrants trying to get from North Africa and searching for a new life in Europe. Not surprisingly many people will be thinking that this feels like a world where God has taken his leave. At the Ascension the friends of Jesus had to face the fact that they were going to have to get used to living in a world without Jesus – or at least living in a world without the Jesus they had come to know. After the somewhat frightening and exhilarating weeks of Easter, in which they had got used to meeting Jesus in unexpected places, in a garden, in a locked room, in a journey on a dusty road, and on a beach sharing an early morning breakfast, he was now saying to them, ‘It’s going to be different. Don’t expect to see me in the old way.’ They must have felt deeply confused, and not a little fearful. According to John’s Gospel, Jesus had been trying to prepare them for this moment, and told them it would be better for them if he went away. But they must now have wondered how it could be better to live in a world where the tangible sign of God seemed to have gone. The other great promise of Ascension and Jesus’ departure is that he will fill his friends with his Spirit. Jesus hasn’t just gone away. He has gone deeper into the heart of reality. He has become more than a visible friend and companion on the way. For the disciples he was now able to be at the very core of their lives, giving them power to become signs of God’s love in the world. Their new task was to bring the face of Jesus to life in the faces of those they met. What happened then continues today! Christian Aid Week (10 - 16 May) is just one reminder that there’s plenty for us to be involved with, which help us and others to see that God has not taken his leave, but is at the very heart of all we are and do. Holy Week and Easter stand at the heart of Christianity. Together they are more important than Harvest, Remembrance, Mothering Sunday - or even Christmas! The heart of the whole message of Christianity is Jesus himself and his self-giving love for the world. He was on the way from small-town Galilee to the city of Jerusalem, from the margins to the centre, where he was to perform his ultimate act of his love and kingship, when he invited his friends to “Take up your cross and follow me”. Justin Welby, Archbishop of Canterbury, said in a lecture recently: “The best decision anyone can ever make, at any point in life, in any circumstances, whoever they are, wherever they are, whatever they are, is to become a disciple of Jesus Christ. There is no better decision for a human being in this life, any human being.” There’s a bold claim if you like! During Holy Week we invite you to come and explore with us what the Archbishop might mean, why Jesus died and how the empty tomb helps us to make sense of life. The Palm Sunday Procession and Communion begins at 9.30am at Rowberrow Church and culminates at about 10.15am at Shipham Church. 6.30pm Choral Evensong in Axbridge Church with the Benefice Choir. 7.30pm Stations of the Cross, Cheddar RC Church, Tweentown. 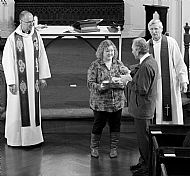 From Quaker to Catholic, this Ecumenical service led by local ministers is always moving. 8pm We will have a service of Tenebrae in St Leonard’s, Shipham. This distinctive ceremony from the Latin word for shadows, traces the story of Christ’s passion as one by one candles are extinguished. 8pm In the Maundy Thursday Communion in Axbridge we remember the Last Supper Jesus shared with his friends. The service ends as the altar is stripped, and for those that are able to stay there will be a silent Vigil of prayer. 9am The popular Cross Walk begins at Shipham Church and ends at about 11.45am in Axbridge Square. Along the way we stop and hear the Good Friday narrative and ponder and pray. 2pm The service of The Last Hour, Rowberrow is a simple and prayerful service for Good Friday. ‘This is the night of new beginnings. This is the night when heaven meets earth. Thought for March 2015: March, Mark and Mothering! March is a full month, with lots of promise. It marks the official start of spring, and our spirits lift as the sap begins to rise! In Axbridge the month begins with the Civic Awards service, a wonderful opportunity to recognise and appreciate some of the community work that goes on, much of it quietly and unobtrusively, helping to make the town a great place in which to live. Many of the 40 days of Lent run through this month as we remember Jesus in the desert. Lent is, or could be, an uncluttered time where we make space in all the busyness to listen for the still small voice. This year we are encouraging people to read the Gospel of Mark. It’s the shortest of the gospels and, with the help of a book by the New Testament writer Tom Wright, we ask the questions ‘Who is this Jesus? What is good news in his life? What is the meaning of his death?’ If you would like to join in one of the groups that are exploring, please ask for more details! I wonder how you would complete these sentences for your children or grandchildren…or even for yourselves?! Do we wish for a long life? Happiness? Wealth – or at least to be comfortably well off? Or something different? I hope you learn to dance in the rain. I hope you aren't afraid to be yourself. I hope you love watching rugby! I hope you get the most out of each day. I hope you laugh at some time every day. I hope you never forget to say sorry and thank you. I hope you ignore people who put you down. I hope you become compassionate. I hope you respect the amazing world around you. Most of all…I hope you grow to know how much you are loved by your parents, by your grandparents (! ), and by God. I trust March will be a wonderful month for you and yours. I guess it was ironic that my final service with the Benefice fell on St Andrew’s day. On 30th November I finished my time as your Curate, after 4 ½ years. We left with much sadness, having made so many good friends and having shared so much with you; early sermons, Ordination, first Communion Celebration, first Funeral Wedding Baptism, experimental services, study courses and the general metamorphosis of trying to make a priest out of some questionable raw material. Though sad, we also felt excitement, as it was time to stretch my clerical wings. As that day came to an end, both Cathi and I were overwhelmed by a huge sense of gratitude to all of you for your love, care and encouragement through these years. Curates are not an extra resource that just helps out, but a job of work for the Benefice. Whilst I hope you enjoyed the task, every encouraging smile, cup of coffee, word of advice, criticisms too, has been treasured and used in my formation. You will never know the time Tim devoted to regular reviews, report writing, visits to my college and general care for us both. I am forever indebted to Tim for the excellent training I received at his hand, and the wonderful example he set me in pastoral care, not to mention myriad cups of strong coffee. Together, Tim and all of you, made my training a joy and made the last 4 ½ years a delight for both Cathi and me. What we have particularly appreciated about our time with you is that all three churches are a tangible witness to the praying, learning and worshiping community that is the Axbridge Benefice. I have not just been trained, we have not just been loved, our faith has been nurtured. Again, thank you. As a final note, I must just say again a huge thank you for the wonderful farewell card signed by so many and the most generous cheque you gave us. We are still thinking about what to do with that cheque, but part of it has gone on a new Preaching Scarf, with some fine embroidery, which I will wear in fond memory of you all at my licensing. As Bishop Peter reminds us in his article on page 5 of the December / January Catch This, Advent is all about an amazing adventure, and involves us in a journey to Bethlehem. For us Advent begins this year by saying thank you and goodbye to Andrew Hemming. Andrew came to us four and a half years ago in the final year of his training at Salisbury Theological College to do a parish placement. He was then ordained at Wells Cathedral in 2011 and has completed his curacy in our Benefice. For the vast majority of this time he has been juggling his ministry here while working for First Great Western, with his daily commute to Swindon or beyond. He has managed to balance the demands of job and parochial ministry, and occasionally fit some time for private life. During his curacy he has made a deep impact on many people through his sunny character, his enthusiasm, energy and honesty. He has a very disciplined rule of life, which is built around belonging to the Franciscan Third Order. His sermons are always carefully thought out, and he has gradually developed his own style. In preaching Andrew is always keen to engage with the scripture of the day, and to ask what it has to say to us, without ducking the difficult questions that are sometimes thrown up. His aim is not to present something – “this is it, believe this” – but to draw people into a thoughtful response to the Gospel. Through it he has displayed a palpable enthusiasm in the mission and goodness of God. We shall miss him as he moves on to his next post, but recognise that he is ready to take on more responsibility within parochial ministry. Cathi too has made a significant contribution, particularly through her part in the Sunday School at Axbridge and Godly Play storytelling. 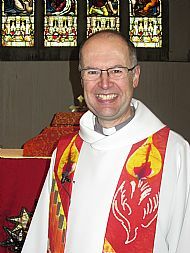 They are moving on to the parish of Redhill, where Andrew will have responsibility for Christ Church, and also contribute to the wider Benefice of Wrington, Butcombe, and Burrington. We offer them both our warm good wishes, our gratitude, and our prayers for this next chapter in the adventure of ministry. For the rest of us, we face our journey to Bethlehem and Christmas. On December 13th in our evening service at Axbridge Beth Samways, who is a lecturer in the History of Art at Bristol University, will be exploring some of the journeys to Bethlehem that we find in a number of wonderful paintings. Not to be missed! We will as usual be having our internal Christmas card, which will be given out in church. If you would like to be included on that, please let one of the churchwardens know. All proceeds will go as usual to the Church Housing Trust. May God bless us on the adventure of Advent and beyond! I spent a fascinating afternoon recently listening to an expert unpicking how Axbridge Church developed and gradually came to be how it is today. Jerry Sampson, an expert on church buildings, talked of “squeezing juice” out of the visual evidence that is all around us. (His visit was part of a day described on page 7 of this month’s magazine.) I’m hoping that we can get Jerry back and give a wider hearing to some of his findings. One of the many new things I learnt about the church was the evidence that an anchorite cell was built onto the north side of the chancel in the middle ages. Next to the door which is to the left of the altar and now goes nowhere, there is a squint that looks like the remains of a little window. Outside it is clear that the window could only be used if the person was kneeling at prayer. The stonework also gives the hint of the roofline of a cell. Medieval anchorites were literally walled up in a small room attached to the side of a church, with a window opening into the church through which they could see the altar and receive Holy Communion. Their cells were called anchor holds as they were thought to “anchor” the church by their prayers. Sometimes anchorites were men, but most of them were women. The whole idea was to live alone in prayer and worship God without distraction. An anchorite is someone who responds to Christ’s invitation to “come away to a lonely place alone and rest a while”. In the Psalms it talks of gazing on God “in the sanctuary to see His strength and glory.” Although anchorites led a solitary life, they were certainly not recluses. As well as an eye to the Holy Mysteries, they also had a window onto the outside world. Through this they received their food, and people could talk to them and ask them to pray for their needs. People looked to them for guidance, counsel, and spiritual revelation. Perhaps the best known anchorite of the period when the Axbridge cell might have been active is Julian of Norwich. Her work Revelations of Divine Love dating from 1395, is the first published book in the English language to be written by a woman. She lived in a time of turmoil, with peasant revolts and the Black Death, but her theology was optimistic and spoke of God's love in terms of joy and compassion, as opposed to law and duty. For Julian, suffering was not a punishment that God inflicted, as was the common understanding. She believed that God loved everyone and wanted to save them all. Her best known saying was "All shall be well, and all shall be well, and all manner of things shall be well." By the late medieval period there were many hermits and anchorites in England, but this came to an end at the time of the Reformation, when even a female anchorite who was over 100 years old was forcibly evicted from her anchor hold. I suspect most of us would think of the anchorite life pretty much as an off the wall and alien way to live. Most of us live in complete contrast at break-neck speed. We have busy lives with work, family, friends, and endless things to do, that leave us with little time to sleep, never mind stopping and reflecting. Perhaps we need to learn how to slow down and stop...and breathe. Then we too might have chance to catch a glimpse of God, and restore the anchor that gives peace. 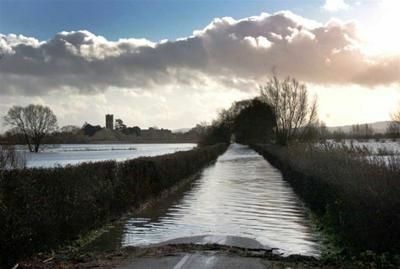 I know the road to Wells fairly well – and the back road to Weston through Compton Bishop, come to that. I’m up and down them often enough. Our local roads can have their frustrations, when you get behind a wide or particularly slow vehicle, and you are late for a meeting, but most of the time travelling along them is a joy. I particularly enjoy the ride back from Wells on a summer evening with the sun shining on the hills. I have to keep reminding myself to watch the road and not the view! A few weeks ago my brother and I experienced it all from a different perspective altogether. I have long promised myself to walk the West Mendip Way, but had never got round to it. Until now! My Dad did the 30 miles as a sponsored walk in a day when he was quite a bit older than we are, but we wanted to enjoy the views. So we decided to split it into two days. Well, that is our story! The vast majority of the way is on footpaths and bridleways away from the road. On the road outside Wookey Hole you come across the sign says ‘This Road is not suitable for Charabancs’! I don’t know what century this comes from, but there were no coaches, cars, or even people most of the time. It means that you see the Mendips in a very different light, and the path took me to lots of places I had no idea were there. Gems like Ebbor gorge. Some of the views along the way are both panoramic and stunning, but what you are aware of up on the hills is the vastness of the sky, and the constantly changing moods of weather and light, which you easily miss in a car. In this harvest season it’s important consciously to reconnect with the soil under our feet and the air we breathe. It helps to lift us back into relationship with our Maker. We were advised that although the walk according to the book goes from Uphill to Wells, it’s best to do it in the other direction, and start at the magnificent west front of Wells Cathedral. If you go from Uphill you see the TV mast above Wells for a long time, and, I’m told, it never seems to get any closer! So we headed towards the sea. This made reading the book and directions backwards a little more challenging. Most of the walks I do of necessity are circular. You have to get back to where you started from, but there’s something about a walk that has a purpose and destination. The other longer linear walk that I did was with a gang of people in my last parish, when we walked The Cleveland Way over the North York Moors and down the Yorkshire coast. With both that and the walk to Uphill, there was a wonderful sense of achievement, when we had reached our destination. When the poet T S Eliot died, his ashes were taken to St. Michael's Church in East Coker, the village from which his ancestors had emigrated to America. A wall plaque commemorates him with a wonderful and thought provoking quotation from his poem "East Coker" in The Four Quartets, "In my beginning is my end. In my end is my beginning." How about getting those walking boots out? Axbridge Church saw the memorial service in August of our oldest member, Jessie Hillier. She marked her 100th birthday on 2nd March by coming to church in the morning and then having a party in Shipham Village Hall in the afternoon. When I asked her what her secret for longevity was, she had no hesitation in saying “hard work, no strong drink, and never giving in”. You may have seen a programme on television recently, 100 Year Old Drivers. Well, Jessie fit the bill, and was driving her big Mercedes in a stately way right up to and beyond her 100th birthday! During the 20th century the average life expectancy in Britain increased by an astonishing 30 years. People are living longer thanks to improvements in health, diet and preventative health care. Today, for the first time in history, Britain’s over-65s now outnumber people under the age of 16. Wells Cathedral is holding a series of Autumn Lectures entitled ‘The Ageing Agenda’, which pick up some of these issues. On three Tuesday evenings there will be talks starting at 7.30pm in the nave of the Cathedral, followed by time for questions and discussion. The purpose of the series is to raise issues to do with growing older and finding fulfilment whatever comes our way. On 9th September Professor Steven Rose, a neuroscientist and Emeritus Professor of biology at The Open University, will be talking about memory. Our memories help to define us, and give shape to our paths through life. Poets, philosophers, psychologists and theologians have thought and written about memory. So what have the brain sciences got to say both about the ‘normal’ processes of learning and remembering, and what happens when memories fade? David Winter, a broadcaster and author, will be speaking on 16th September. His recent book ‘At the End of the Day’ has a sub title ‘Enjoying Life in the Departure Lounge’. He promises to focus not on frailty but on how to live with purpose. If people are living much longer, how can those ‘extra years’ be made fulfilling and fruitful? Dr Harriet Mowat will complete the series on 30th September. She writes, teaches, and researches in matters to do with the spiritual care of older people. Her talk ‘Growing Older: Opportunity and Challenge for the Spiritual Journey‘ will look at the way in which we think about ageing and what influences our individual experience. How do we live well – with purpose, joy and hope – in the departure lounge? That’s the question! On Saturday 19th July Axbridge remembered the events of 1914 as they affected the local community. Scenes of life in the Square of those days movingly helped us to get under the skin of what it might have been like for people then. Many of us had tears in our eyes as an officer and an army volunteer, both still in their teens, marched off towards the station. As they made their way up the church steps, women and children threw petals towards them. So too the evening reflection in church was filled with a powerful blend of music, drama, images and poetry, that none of us will forget in a hurry. On Sunday 3rd August at Shipham you are invited to a simple service of readings and prayers at 4.00pm remembering those from the village who were affected. On Monday 4th at Axbridge we will be joining people across Britain in a national event entitled A Million Candles. The event is a reminder of the words spoken by Sir Edward Grey, Foreign Minister, on 4 August 1914: "The lamps are going out all over Europe; we shall not see them lit again in our lifetime". We will gather at 10.00pm for a period of reflection and remembrance. At 11pm, the time war was declared in 1914, the candles will be extinguished. A number of people have asked me why we were remembering the distant days of a hundred years ago. The answer has came back loud and clear in the most poignant of ways in the last week. 298 people, and the nations they were from, on board a flight from Amsterdam to Kuala Lumpur were suddenly drawn into what had seemed a local conflict in eastern Ukraine. At the same time Israeli forces were entering Gaza at enormous cost on both sides. Axbridge Remembers ended with a poem Carol Ann Duffy wrote to mark the deaths of Henry Allingham and Harry Patch, the last two British veterans of the First World War. It has a vision of how, rewinding time, things could be different. that moment shrapnel scythed you to the stinking mud . . .
to die and die and die. Dulce -- No -- Decorum -- No -- Pro patria mori. from History; the glistening, healthy horses fit for heroes, kings. and crammed with love, work, children, talent, English beer, good food. You see the poet tuck away his pocket-book and smile. In the next few weeks we come to the end of another busy school year. One of the highlights, which I look forward to, at both Axbridge and Shipham are the Leavers’ Assemblies in Church. It is always an emotional moment when a child comes to the end of their time in First School, and moves on to the next stage of their education. This term there will be the added pathos of saying farewell to two important members of staff. Mrs Antonia Gwynn has been Head Teacher at Shipham for twelve or so years. Mrs Sarah Dibb has been Deputy Head at Axbridge for many years (as well as a time when she was Acting Head), and before that was a class teacher. Both are retiring this time, and both have given fantastic service to the profession, and to generations of children and families in our communities. With the myriad of changes in education in recent years, they have managed to maintain teaching and enthusiasm and commitment of a consistently high quality. There will be opportunities to say appropriate thanks to them both. A great teacher is worth their weight in gold, and their influence often stays with a person throughout their lifetime. Years later most of us can remember our earliest school days and the important lessons we learned then. Much is said and written about what should be in the national curriculum, but I particularly like a piece, which describes some of those hidden qualities and values, which gradually seep into a child and help to form the adults our children become. It is called “Children learn what they live”. If children live with friendliness, they learn that the world is a good place to live. May our children and grandchildren have the best start that we can give. May Mrs Dibb and Mrs Gwynn enjoy their retirement, and may the rest of our teachers have chance to re-charge their batteries for the year ahead! In his popular hymn “One more step” Sydney Carter talked of a faith that was ever old and ever new. I was showing a class of children from Axbridge School round church this week and noticed two interesting dates. The list of Rectors of Axbridge in the back corner traces my predecessors back to a character called dom. Joseph in 1264. (The dom. bit is short for ‘Father’ and probably means that he was a monk.) When I did the sums, I realised that 1264 was exactly 750 years ago. So this year marks a significant anniversary. I don’t think this is the oldest reference to a church in Axbridge, but it certainly takes you a long way back to the reign of Henry III, and way before the present church was built. I find this line of continuity of worship and service and presence of my fifty five predecessors both humbling and exciting. The other date was on some of the communion plate in the safe, which records that it was a gift of Mr John Waters of Axbridge in 1714. This was 300 years ago, and in the final year Stuart monarchy and the start of the house of Hanover. Residents of Axbridge have shared in Holy Communion in this place, holding that chalice and paten for three centuries. This month we will be celebrating another significant milestone in the story of the church in this area when the new Bishop of Bath and Wells will be installed in Wells Cathedral on 7th June. Peter Hancock is the 78th bishop of our Diocese, in a line going back even further to the year 909AD! Now that the controversy about where he will be living has been thankfully settled, we can get on with celebrating his arrival. He in turn can get on with the job he is called to do. In the charge, or job description, given him by the Archbishop of Canterbury, he has been tasked ‘to share the gospel across the diocese of Bath and Wells and to nurture the confidence of others to do likewise…encouraging aspirations for a growing and flourishing Church’. To do this he will need a faith that is fresh and alive for our day. And so do we in Rowberrow, Shipham and Axbridge! The day after the Installation is Pentecost. Bishop Peter has recorded a short sermon to be used where most appropriate in our celebrations. In it he speaks of the promised Spirit of God and of the exhilarating and terrifying journey that the disciples and were about to begin. Lord, send your Holy Spirit upon us and clothe us with power from on high. Thought for May 2014: A Christian Country? The Prime Minister has been in hot water in the press recently over what he said at his Easter reception at Downing Street in which he called Britain a Christian country, and that Britain should be unashamedly “evangelical” about its Christianity. “Some people feel that in this ever more secular age we shouldn't talk about these things. I completely disagree. I believe we should be more confident about our status as a Christian country, more ambitious about expanding the role of faith-based organisations, and, frankly, more evangelical about a faith that compels us to get out there and make a difference to people's lives,” Mr Cameron said. What response has David Cameron had from faith leaders? Interestingly, Farooq Murad, the Secretary General of the Muslim Council of Britain, said: "No one can deny that Britain remains largely a Christian country with deep historical and structural links with the established Church. . .We also believe that as a nation we will be stronger by recognising and celebrating the increasing reality of its multi- and no-faith traditions living in harmony." Thought for April 2014: Food, Glorious Food! From The Great British Bake Off and Come Dine With Me to Masterchef, and from Mary Berry to the Hairy Bikers, we do like our food and the celebrities that cook! A great chunk of the television schedule is taken up with cooking. While we drool over the creations, it is perhaps not surprising that the nation’s average waist line expands. At the same time the scandal remains that too many of the world’s poor go hungry. Lent is a time for us to think more carefully about the food we eat, and the way we eat it. The Bishop of Taunton is fasting every Wednesday throughout Lent as part of a campaign to highlight hunger in Britain. He has joined other faith leaders, celebrities and foodbank volunteers across the country. Bishop Peter says: “The number of people needing food aid is still rising. This is an opportunity to show solidarity with the thousands going hungry in Britain today. I pledge to fast every Wednesday between now and Easter, and I urge others to consider showing their support too, by taking part in a nation-wide day of fasting on 4th April.” End Hunger Fast is a national campaign on 4th April to show the government that Britain is hungry for change! There is clearly something very important about food that goes beyond simply providing our bodies with fuel. A friend of mine, Doris Gibbons, needed to move to sheltered accommodation. She was moving from the home where she had grown up and lived all her life, and had serious decisions to make about what she could take with her and what would fit in her new flat. The one thing that she had to get in somehow was the family dining table. It held so many precious memories for her. Food is an important focus for family, belonging, and hospitality. In Holy Week this year we have two opportunities to join in significant meals. On the Wednesday of Holy Week (16th April) we will share a Seder meal together in the George Thiery Room of Shipham Village Hall. Because of the limited number that we can cater for, this will have to be a ticketed event. If you would like to come, please look out for details of how to book. The meal, specially prepared, enables Jews each year to relive their history. Each part has symbolic significance – for example the salt water represents the tears that the slaves in Egypt had cried, and the Passover lamb represents God’s deliverance. The story that the meal re-enacts has significance both for Jews and Christians. On Maundy Thursday (17th April) we will be celebrating a Thanksgiving for the Eucharist at Axbridge Church, remembering the Last Supper that Jesus shared in the Upper Room with his disciples. It summed up the hospitality of his love and acceptance of them. It reminded them of the friendship they had shared and the new community they were called to be. It was a seminal moment that Jesus used to interpret the meaning of his death, and how they should remember how he would be present with them. In the sharing of bread and wine Jesus invites us to his table as his friends. We are reminded both of God’s sacrifice for us, and the assurance of a future heavenly banquet. Happy eating – and, when it comes, Happy Easter! Our homes mean so much to us. They speak of memories and hopes, and the energy we have put into them. Over the past weeks we have seen the heartbreak and sense of hopelessness as both homes and businesses have been wrecked in the flooding of the Levels, and in other parts of the country. Whole communities have been struggling, and some properties have been inundated by water and sewage since before Christmas. One vicar in the midst of it all, Revd Jane Haslam, said that the Church's role was to be there throughout. "In a rural community like Moorland, with no shop or school, we have a presence and are still there. We held a service in nearby North Petherton at the weekend, asking people to gather and comfort and pray for each other, and more than a hundred came. We are there with people in their sorrow, but also to say: We have hope, too." 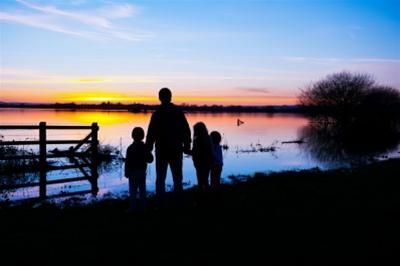 Somerset Community Foundation is well placed to relieve the immediate hardship that individuals, families and communities are facing and support their recovery over the coming weeks and months. Support is already being distributed, but they need to ensure that everything possible is done to alleviate the immediate crisis and support a swift recovery. The response to their appeal has been heartening, and any further donations can be made to them at Yeoman House, Bath and West Showground, Shepton Mallet, Somerset BA4 6QN. by the rising waters and the rain of tears. in lament for all that is lost. Bless us we pray, in the name of Jesus. Amen.